Dr. Richard Amato places bone grafts for patients who have lost too much bone to support dental implants. As a periodontist and implantologist, Dr. Amato often sees patients whose teeth have been missing long enough that the bone has deteriorated and cannot provide the necessary support for implants. Bone grafting augments the existing bone so that implants can be used to replace teeth. Monroe, CT Periodontist, Dr. Richard Amato Can Perform Bone Grafting In Preparation For Dental Implants. 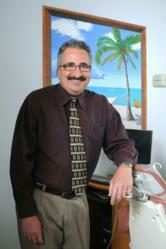 Dr. Richard Amato is a specialist in Periodontics and Dental Implant placement. He uses dental implants to replace missing teeth. However, when teeth are missing for any reason, bone begins to deteriorate because there is no longer a tooth to stimulate regeneration. The process continues until something is done to reverse the deterioration. There are many reasons teeth may be lost—including accidents, tooth decay, trauma and gum disease. However, many people do not realize how important it is to replace the missing teeth as soon as possible to avoid this bone loss. Dental implants are frequently used by the periodontist to replace missing teeth. They are made of titanium and can fuse with the bone to provide strength. They also stimulate the jawbone so it continues to regenerate, much like natural teeth do. However, if too much bone is lost before the implants are placed, a bone grafting procedure can be done to augment the jawbone. Once the graft has healed and fused with the existing bone, the implant may be surgically placed. The three most used bone graft procedures include autogenous grafts, allografts and Xenografts. Autogenous grafts utilize bone from the patient's body where it is not needed. The allografts are not from the patient, but consist of human bone tissue. Xenografts are non-human bone tissue, often taken from a cow bone. The periodontist installs the graft with tiny titanium screws as anchors to hold the graft to the existing bone. The healing process may take up to nine months before the dental implant surgery can take place. Patients who want dental implants to replace missing teeth must be screened to determine whether there is enough bone in the area for the implant to fuse with. That is why Dr. Amato recently installed an i-CAT cone beam scanner. The 3D radiographic scans allow accurate determinations of bone levels beforehand. Without the bone grafts or the implants, a person may begin to acquire a sunken appearance to the face as the bone continues to deteriorate. Interested patients should visit Dr. Amato’s website at http://www.connecticutperiodontist.com to learn more about dental implants and bone grafting. Dr. Richard Amato is a technologically advanced periodontist offering patients personalized dental care for eastern Fairfield County, Connecticut since 1989. Dr. Amato received his Doctorate of Dental Surgery degree from Stony Brook University where he was awarded the School of Dental Medicine Department of Periodontics Award for Excellence in Periodontology. Dr. Amato completed a specialty post-doctoral residency and received his Certificate of Proficiency in Periodontics from Eastman Dental Center at the University of Rochester. He is part of one percent of dental professionals providing the most recent FDA cleared laser procedure for gum disease and periodontal treatment. To learn more about Dr. Amato and his dental services visit his website at http://www.connecticutperiodontist.com and call (203) 712-0917.